Thanks to the generosity of Sue Wildman, Carpe Diem has come back to the SSF breeding program. Carpe is the second daughter of our fantastic Thoroughbred mare, LaLiscia (read more about her at Eliscia SSF). 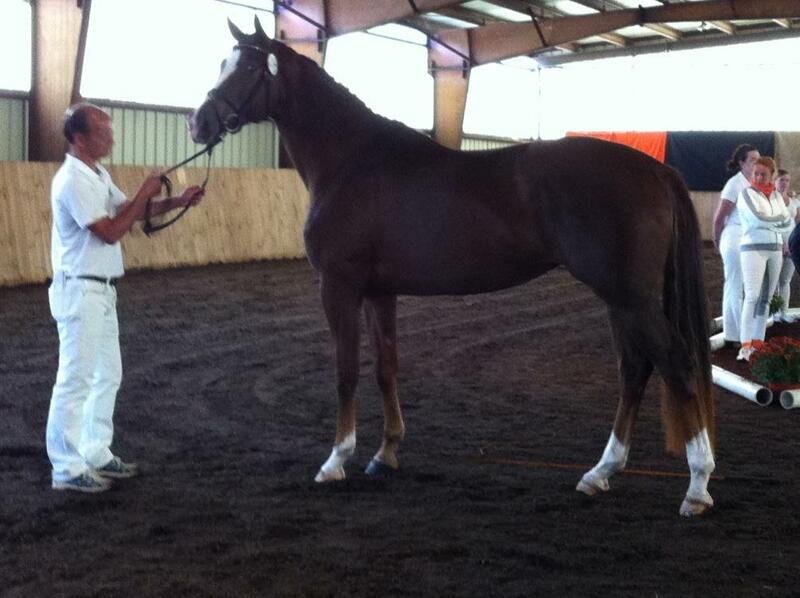 She is a keur eligible mare, and was Reserve Champion of North America as a four year old. Carpe sustained a neck injury and couldn’t stay in training, so Sue offered to send her back to us for breeding. She is a big, solid mare with impeccable conformation and powerful movement. Her first foal for us, Luna Diem SSF, is by the top stallion Connaisseur. Dressage rider Ashley Shaw pre-ordered this filly. Carpe didn’t cooperate in the breeding business the next couple years, but she is currently in foal to Don Tango B for 2018. During their visit for Michaela’s wedding, our Gelders-breeding friends from Holland, the Peters family, insisted we try breeding this mare to their stallion, Alexandro P. I am undecided, however. Gaudi will be a fantastic cross for her.